do not listen to voices which speak the language of hatred, revenge, retaliation. Give yourself to the service of life, not the work of death. Violence is the enemy of justice. Only peace can lead the way to true justice. 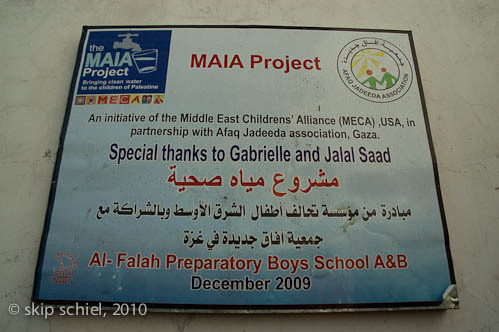 We photographed and videoed the Maia water installations by and for MECA, the Mideast Children’s Alliance, finally, after weeks of trying to line this up. I believe Mohammed produced the final liaison, with prodding from Mona and help from Josie. 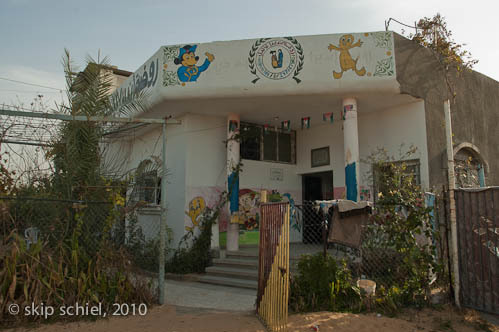 We first visited a private kindergarten in Beit Hanoun, I believe it was. I was dismayed to find the device in a small alcove without any lighting. Nearly total darkness. I’d not brought my big flash, could only hand hold for non-flash shots and hope the flash did not ruin the image. Mohammed seemed not to have problems with his video rig. 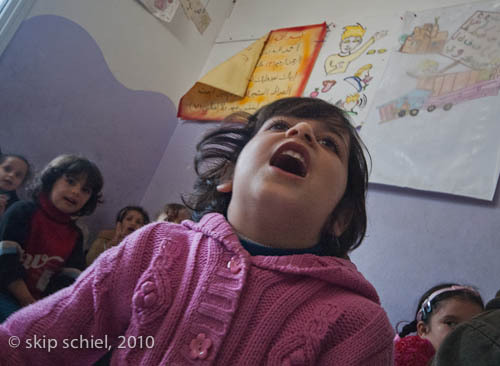 We then visited a few classrooms where children sang for us, at times in English. And then the interview with the enthusiastic and very responsive head of school. 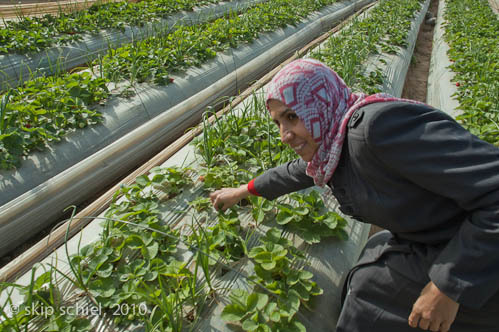 She concluded the interview—how the water came to the school, what differences that it makes, how much the kids know about its source, etc—by bringing us to the strawberry field across from the school. Previously I’d visited it, tempted to pick a few berries. She launched into picking and giving handfuls of the most delicious, juicy ripe strawberries for a mini feast. All this on camera, both cameras. 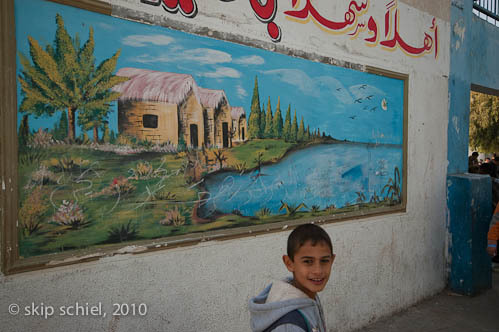 Next we headed to a boys’ school in mid Gaza city operated by UNRWA, UN Relief and Works Agency for a second installation. 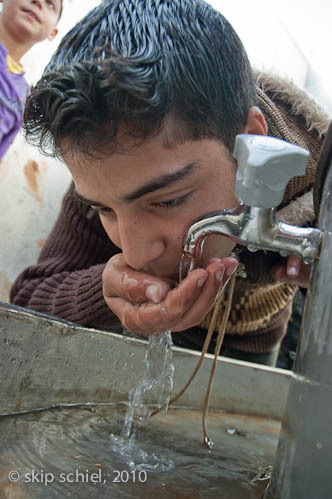 I’d requested visiting one installed unit, one being installed, but Adham informed me that all had been installed, despite the list Josie sent me of yet to be installed water purification systems. The process appears to be reverse osmosis. 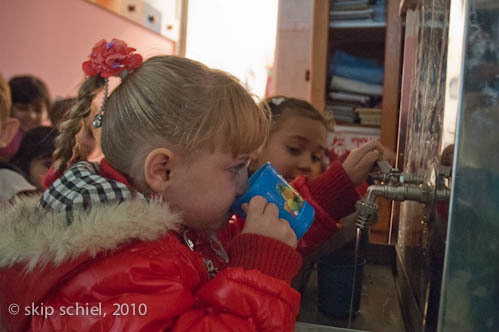 At the school a young man versed in English explained that they need to change the filters monthly, there is not enough water for both shifts of students, and as is true at the kindergarten, students are aware of the source of the units (I’d check further before declaring this). They appreciate the service. 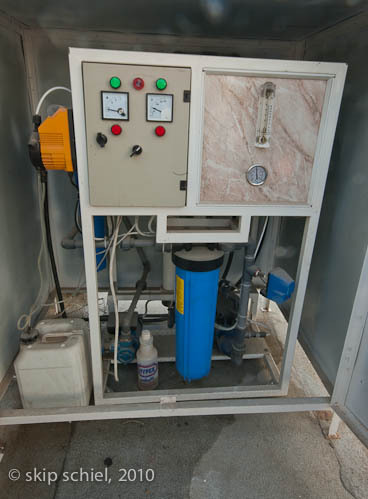 The filtration unit at this site was on a roof, plenty of light, and the dispenser itself was also outside. So light was not a problem. Boys enthusiastically cupped their hands to drink the water in front of the camera. 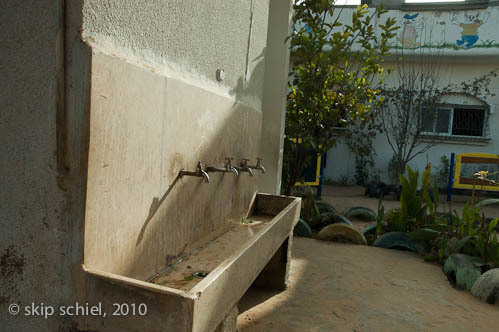 After viewing the device, standing atop the roof of the toilet, the man pointed to the neighboring elementary girls school—no pure water there yet. More money needed. Apparently the process is: direct city water into the filtration device, store it, offer it. Very simple. The boys’ school device was about twice the size of that at the kindergarten. So we can assume there are different devices for different locations. I didn’t ask about cost of purchase, installation and maintenance, nor of longevity and ease of maintenance. As I explained in an on camera interview, I have a very personal connection with the water installation’s topic: I’ve loved and photographed water for decades, and I am connected with folks in Boston who’ve raised big bucks for the Maia project. 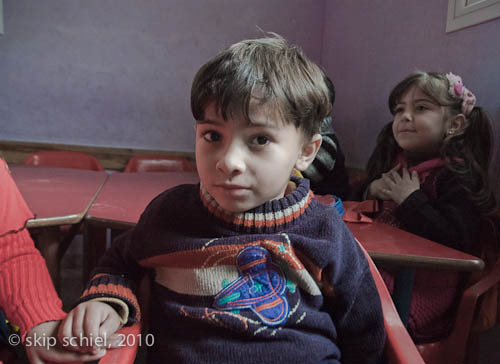 I believe Friends Meeting at Cambridge donated to MECA shortly after Operation Cast Lead, the ruinous Israeli attack on Gaza beginning on December 27, 2008, along with our donation to the Gaza Community Mental Health Program. wishing to share our food with them, trying to communicate with the lost ones. Then another—maybe the night before—standing with a group protesting some element of the Israel occupation when a leader from the pro Israel group invited one or a few of us to address his group. Long silence, long pause, I was tempted, wasn’t sure it would be wise. Later I thought, I’d try a discussion not with the entire group but with elements of that group. If this were to happen, what would I say, what would they say? I felt ashamed by not immediately accepting the invitation—and that no one else from our group accepted. This second dream is good preparation for such a possible invitation. Full moon waning, continuing warm and dry weather.